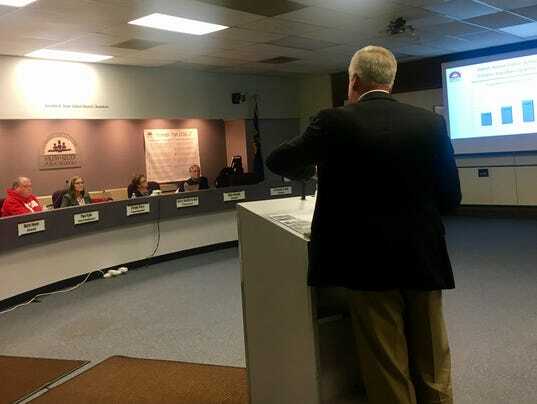 The Citizens Facilities Task Force presented its official report on overcrowding to the Salem-Keizer School Board Tuesday evening. Among the recommendations are a new elementary school, dozens of new science labs, fewer portable classrooms and a change in boundaries. Over the past few months, the task force — a group of 18 community members and a handful of district staff and board liaisons — met to discuss school capacity and core infrastructure, schools and support buildings, instructional technology, educational adequacy, safety and security, seismic conditions, and funding. The effort culminated in the Citizens Facilities Task Force Report, which includes a list of recommendations, cost estimates, and funding options. The subcommittee on capacity and core infrastructure recommended removing portable classrooms at multiple locations, replacing the existing Auburn Elementary School, adding or renovating gyms, cafeterias, classrooms, and libraries, and changing the boundaries of four of the six traditional high school feeder systems. All six high schools would have capacity changes. Mark Shipman, the leader of the subcommittee, estimated the cost to accommodate all elementary school needs, including improvements at 22 schools, to be $128 million. For middle schools, there would be eight schools in need of core construction and the removal and replacement of end-of-life, portable classrooms with brick and mortar classrooms at Waldo, Judson and Stephens Middle Schools. This total comes to an estimated $49 million. To keep enrollment balanced among the high schools, the task force recommended changing the boundaries for five of the six traditional high schools, excluding West Salem High School. It would present a solution for each school to serve 2,200 students per school — 2,000 for West — without having to spend as much for a new high school. To accomplish all the high school needs, the task force estimates the cost at $266 million. The subcommittee on education adequacy and building needs recommended addressing seismic upgrades at high risk schools, adding 27 science labs in middle schools and 12 in high schools, relocating the front offices of 17 schools for surveillance, upgrading intercom systems, retrofitting badge access systems at 53 schools, expanding wireless networks across the district, increasing career technical education courses, and more. Lisa Harnisch, the leader of the school and facility needs subcommittee, said the theme around the group’s discussions were commonly around equity. Addressing schools and support buildings is estimated to cost $123 million; instructional technology and infrastructure are estimated to cost $12 million; safety and security efforts are estimated to cost $37 million, and seismic considerations are estimated to cost between $56 and $151 million. The cost estimate for education adequacy, including the science labs, is included in the first subcommittee’s estimates. Harnisch said they are hopeful Measure 98 can help offset costs for adding career technical education courses. Though the cost estimates are in the beginning stages, Michael Wolfe, chief operations officer for the district, said the total price tag could range from $671 to $766 million. Jay Remy, a spokesperson for the district, said this number shows the needs in the district, but officials will have to decide which recommendations to pursue and the feasibility of each item. A handful of funding options were reviewed, but the task force recommended the school board pursue the option of using the general obligation bonds. The school board will now review the report, clarify questions, and discuss what they want to implement, and how, moving forward. For more information or to read the full report, go to www.salemkeizer.org/district/citizens-facilities-task-force or call 503-399-3001. A recording of the board meeting can be viewed online at www.cctvsalem.org.